Thread: micro handles for HQSixteen? I am considering purchasing the micro handles for my HQS and I am wondering if anyone has them and if you love them or could live without them. LOVE them. Mostly use them instead of the others. I have the HQ avante. I do not have them yet for my Crown jewel but I had them on my Viking 18x8 and I loved them! I got them for my HQ16 when they came out and love them. Like quiltyfeelings I use them most of the time. 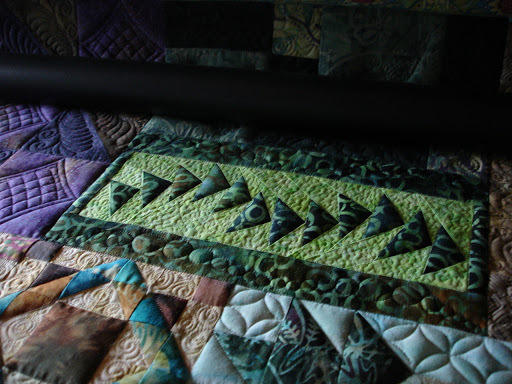 They are simply indispensable for fine work such as micro stippling or micro quilting. You are closer to the needle which gives you finer control over your machine. I got mine when they first came out. Used them on HQ16 and when I upgraded to the HQ18-Avante I also got them. I used them about 90% of the time. Helps me with my accuracy. I don't agree with this. I do not have micro handles on my Innova and I can definitely do micro work with out them. I have done pebbling as tiny as a 1/16" and the lime green background in this block measured 4" x 12" and has microstippling that I was able to do with regular handles. The light tan block to the lower left, 1" patches with swirls.